GL450 has a 7-pin Trailer Electrical Outlet next to the Hitch. Anyone have a diagram of which pins supply which functions? I am trying to determine which pins are necessary for backup lights to come on when the vehicle is put into reverse. Also, is there a fuse that needs to be installed to get the reverse lights to come on? If so, which fusebox (location) and what's the fuse number? I have hooked up a trailer light and it works manually, but I have not been able to get it to come on automatically when I put the GL into reverse. I am also following the same path as you but still no success. 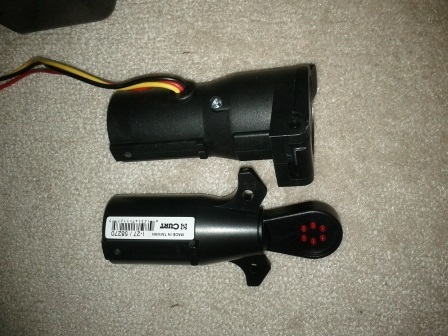 I have a 2014 GL350 in Canada and I am trying with white night Fixed Mount light unit Part # 4199 and PLUG N GO wiring adapter Part # 4149. However I think most of things should be similar for both of us. 2) As per diagram you should always have power in - + pins (IF you think as a clock those are at 7 and 1). If you have a permanent light mode in your hitch light you can test this. Now for the revers center pin and – pin are used. When the car on reverse this trigger a relay inside the light to connect the power to the lights. In my case permanent light works but not the reverse. 3) Fuse box is located under the rear seat of driver side. Lift it and you will see a cover and remove it you will see the box. And at side you should find a small booklet explaining the fuse locations what are they used for. Hitch related fuses are in this box. If found 2 15s fuses missing in location 111 and 126. I got those from a MB dealer (I didn’t replace them with 15A from normal auto parts shop, bcz I am not sure they are the same). Still I have no luck. Now I need to test the center pin and – ground pin has power when car is on reverse. Now to test this I have a multi meter and gong to test during this weekend. Or I can buy something like "Curt Manufacturing 58270 12V 7-Way Rv Round Circuit Tester" from Amazon for 10$. This way you don’t need to go under the car while it’s on reverse. Also I checked the digital manual in the truck (scan for hitch power) it says nothing much other than " a qualified mb tech will give you more information" . May be there is SW update to activate the hitch pins. Anyways good luck and please post any of your findings too. Last edited by AJZ4; 01-09-2014 at 02:22 AM. We are on exactly the same path and you are a few steps ahead of me. I was about to get the fuses for 111 and 126 today, but you already have done so and it did not work. That's certainly not good. I won't be able to do much more than you're doing. I was planning on checking for power as well. Have you called White Night to see if they have anything to say??? At least it works in manual mode, so you know it lights up. It really seems to be a simple problem of not having power at the expected pins (7 & center). I plan on calling White Night today to see if their plug is set up expecting power at (7 & center when the switch on the light is flipped to the reverse lighting position. By the way, I completely installed the light prior to finding out it does not work. That was kind of dumb, but it looks good and it sure is bright. The attached image of the plug confirms what you say. Power needs to be at pins 7 & 1 when the GL is in reverse. From my perspective, that's the next test. Since the light works in manual mode, I know I have power at 7 & 4. I am assuming when you throw the switch on the light to the other side, it is looking for power at 7 & 1. I plan to confirm it with White Night. By the way, it sure would have been nice if that fuse allocation chart had more detail on the fuses for the trailer other than a blind list of fuses that simply say trailer. White Night has confirmed (Anthony) that they expect power at positions 7 & 1 for reverse. That's what happens when you throw the switch on the light. It goes from look for power at position 4 to position 1. So, I am going to make sure I also have all of the fuses in place and see what happens. If there still is no power at 7 & 1, then we'll have to determine if there is some sort of other problem. There is no question that the light we certainly eliminate the "lack of lighting" problem. Let me know if you get the multimeter on this as that is going to be the crucial information. This is one of those situations where you start off with a $100 solution and it gets out of hand. You could always have someone wire the rear lights so there is power at the bottom of the bumper. Money can solve many problems. Anyway, for now I am not sure what to do. By the way, I was also told that the OEM backup lights are actually LEDs. That was news to me. Those are some seriously dim LEDs. I have a quick question. If the computer won't turn these pins on unless you have a trailer plugged in, what happens if you just plug in a trailer connector? Is the mere presence of the trailer connector enough to turn on the these pins? I am using a standard 7-pin trailer power connector. Almost seems that there should be a way to fool it. But, I don't want to blow it up! Obviously, the computer then uses some lead to ascertain a trailer is hooked up. My suspicion is that they use the ground lead from the plug and make sure it is grounded, because some people will use adaptors and 4 lead plugs, which only have turn/brake signals, running lights, and a ground, and it would have to work with these. I'd try taking the ground lead and hooking it to a ground, to see if this works. 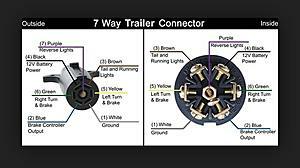 It would also be a safety device to ensure the lights on the trailer are working and they are not inoperative because of a bad ground. As a hint, I can tell you that the GL will tell you if you have a light out on your trailer. I had a message in the dash console say check my rear right trailer directional signal. I'm not sure what it uses to test this, but assume first it recognizes a trailer is there but there's no current flowing through the path (a bulb out, acts as an open circuit). It may mean a ground detection is more likely, since both brake turn signals and/or the running lights could give out. In any case, it is a simple test to see if a ground detection system is what activates the trailer wiring. Is there a special 7-pin plug that MB makes? I assume not. 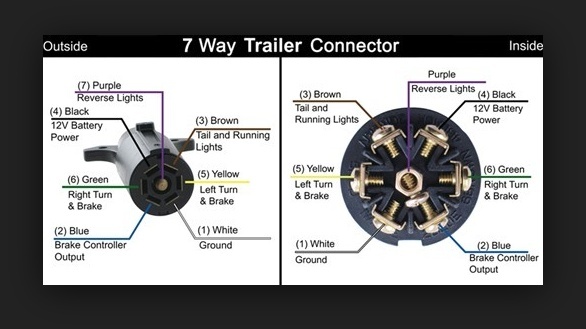 Jim, does your trailer just use the standard plug? Argh. Very annoying. So close, yet so far from a solution. Here is how it looks in the attached photo. That's the beauty of using the ground as a detection means (if this is what they do). If your ground is made correctly, it should work, no matter what, whereas the other lights can go out for a number of reasons. If the ground is not made, then the other lights will not work, even if there is voltage at the plug. (this is a common problem with non-functioning trailer lights). I'm just glad to hear about your work on this, because when I check a non-functioning light, I usually check the female plug to see if the first connection is live, then I will work my way downstream on the wiring. Obviously, on MB's plugs, this will not be work unless the detection system gives it an OK.
Last edited by Ed Wolcott; 01-09-2014 at 07:40 PM. Jim, does your trailer just use the standard plug? Yes, I haven't hooked up the horse trailer yet, since I don't have a brake controller installed. I was using a standard trailer, that has the 4 prong flat pig tail adapter plugged into the converter plug. Good luck, would be a nice feature if you can get it to work. Just called e-trailer and they will have someone call me on Monday. I was thinking that this part or something like it might work. TR2014. Anyway, I am continuing to forge ahead. Weather is terrible here, so I can't go and do other testing. One thing I assuming is that MB wires all of those pins to work on their factory installed towing system. Can anyone verify that they have reverse lights working on a real trailer???? That would be very good to know at this point. Last edited by Steve Maislin; 01-11-2014 at 05:01 PM. Okay the good news first: I manage to get hitch light work during reverse. It worked only when I piggyback hitch power tester to the back of white night power adopter. I need to contact the white night guys to get an explanation. The Bad news: When I reground the black wire to the chassis. GL shout the entire power to plug. i.e. manual light also not works. I am not an electrician but most probable reason is black wire is not ground but a live (+) and direct shorting made GL to shut down the entire power to the hitch. Luckily all okay after removing the reground and re-starting the GL. The long story: I was not comfortable to go under hitch when car is on reverse and I ordered a "Curt Manufacturing 58270 12V 7-Way Rv Round Circuit Tester". Pugged the tester directly to the Truck hitch power outlet and check all the indicators. Head light, Left turn, Right turn and the reverse. All works perfectly. Thus no issue in GL side. Then I wanted to check any loose connections in white night power plug and insert the tester to back of the white night power plug. 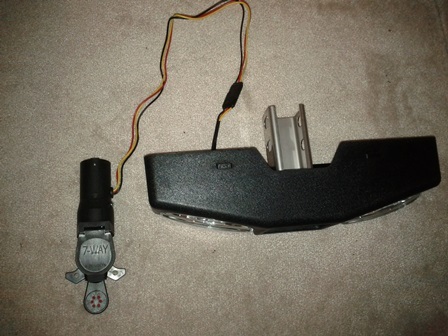 Then all the indicators also worked including the hitch light. I can leave all together like that and secure with a cable or something. But I think it sticking out too much. Someone can kick and complete unit can break or hit something while reverse. I will update again once I get a reply from White night guys. Last edited by AJZ4; 01-12-2014 at 01:45 AM. Sounds like the tester is fooling the GL into sending power. This is exactly why I called e-trailer and left a bunch of information as I await a call from them next week. From what you are showing, it appears that if I plug a tester into the Plug-n-Go the rear lights should just start working. I just checked my setup which uses the fixed version of the White Night and it appears I could plug in a tester and still have the White Night exactly as you see it in my picture that I posted above. There is just enough clearance. However, my goal is to get a 7-pin adapter that will fool the GL that will have a 3-way flat plug that will go into the light. Amazing to have to do all of this for something that appeared so simple. I believe it is the answer to the situation. I have asked them how the output pins on the 5-way correspond to the 7-way. From the picture it looks like you get pins 1,3,5,6,and 7. If this is the case, we would get the reverse light power that the White Night needs. 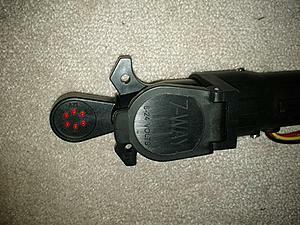 On the lights 3-pin we would use yellow to 7(reverse) and black to 1(ground). Manual on would probably not work, that the red lead. Anyway, I will await an answer. This is what I have ordered and soon I will report on status. I will be away next week, so if it does not come this week, there will be a delay. I have given up on this project. I cannot beat the GL computer. Too many issues as this system either needs a real trailer compliment of lights or nothing. This is just not worth all of the trouble and I don't want to end up doing damage. It was a good try and an interesting project with a small investment in time and money. Oh well, at least I tried it. 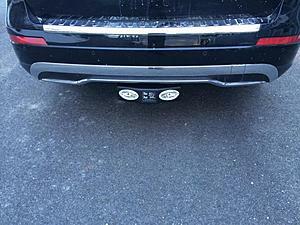 We'll have to see how blittle reports on the new bulbs in the license plate for improving the rear camera. What happened to stuff you ordered? In my case I tried contacting white knight guys and they have also stopped replying, me looks like they don’t have an answer. Thus I am going to use the hitch tester permanently attached. And that way all works fine. Doesn't it shut off your blind spot warning feature when you have it connected? It should as it thinks you have a trailer connected. That was the final straw for me. I tossed everything out as I was truly finished with trying this solution. I will wait on BLITTLE to see if he is successful. I was also told by the dealership that a local company rewires things and puts high-powered PIAA lights back there. However, that seems a bit extreme. Last edited by Steve Maislin; 01-20-2014 at 07:08 PM. Supposedly, the lights I ordered from AZN Optics are for the BACKUP lights in the liftgate assembly….not the plate lighting bulbs. The actual "backup" lights are the culprits….they throw 0 light. Im not sure that replacing the plate bulbs would do anything more than put brighter light on the plate. I have the bulbs but am waiting to talk to my tech guy first before trying to install.